Customer Name: Maruki Gardening/Contracting Co., Ltd. The ZX10U-2 at work for planting at land reclamation. Breaker piping provided for future use. The customer has been engaged in various jobs, including landscape gardening and civil engineering works. The customer has strived for mechanization in a wide scope of jobs, from planting, leveling, paving to ditching. The fleet ranges from mini excavators to 20 ton class hydraulic excavators. This investment pays enough for labor costs. The construction machine is productive, and increases the safety at work place. Owning the machine (not rental) allows for the profitable use, and reduces downtime. The machine can also be well serviced and maintained. To get the job done on time, owning the machine is best, eliminating worrying about rental contract. The ZX10U-2 was introduced at the end of last year, outperforming other mini excavators owned by the customer. The undercarriage width is adjustable in the range of 760 to 1000 mm. Retracted for access to confined space, and extended for stable operation. Mr. Yukitoshi Kuroki, president of the customer, was first impressed at demonstration that the ZX10U-2 was powerful, agile, and rugged. He instantly decided to purchase the ZX10U-2. His prospective is: job category will be shifted from public construction projects to private sector projects. This will increase jobs in confined spaces, and demolition works for resources recycling. The ZX10U-2 is now an indispensable workforce at job sites, not allowing for planting at his housing despite his hope. Mr. Yoshitaka Yada, engineering manager, appreciated high performance of the ZX10U-2. He said, actions are fast, and combined operations are smooth, resulting in about 30% increase in production. Visibility and stability are excellent. In particular, operator’s eye level is high enough to look at the front attachment during excavation for planting. For a mini excavator, the selection of travel modes is very convenient at confined job sites. According to job needs, we can select high or low speed. The machine, when crawlers being retracted, can enter limited spaces. We are fully satisfied with the ZX10U-2 performance. 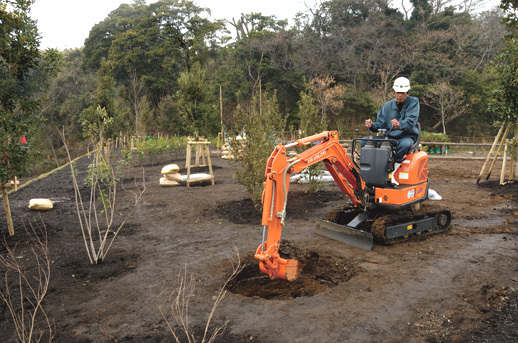 The selection of the Hitachi ZX10U-2 is the best solution to landscape gardening. *For more information, please contact us (Hitachi Construction Machinery). *Duplicate of articles shown is prohibited without permission. *The machines may not meet the regulations depending on countries. Diagnostic Tools – MaintenancePro Dr.
© 2019 Hitachi Construction Machinery Co., Ltd. All rights reserved.